The SIFI Mini WELL IOL provides a progressive, extended depth of- focus experience for patients – not just a few sharp foci. How is this achieved? What does this mean for patients? And who are the best candidates? Gerd Auffarth shares his thoughts. How does the SIFI Mini WELL work to give progressive depth of focus? By having two concentric central zones with spherical aberrations of opposite sign, and an external monofocal zone (Figure 1). Fig. 1. The Mini WELL has a progressive optic (a) with a central distance zone (D1), a surrounding distance zone (D2) with spherical aberration of the opposite sign, and a peripheral distance zone (D3) with monofocal characteristics, which leads to a progressive, extended depth of focus (b). The key concept is that it doesn’t use the diffractive principle of having different foci. 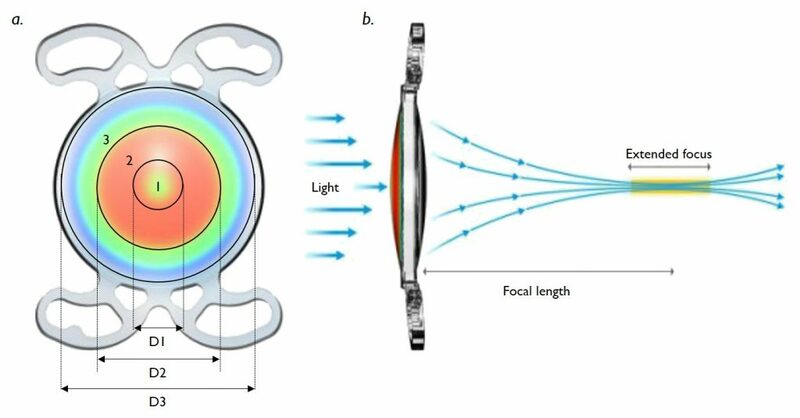 Instead, the lens optics has zones of different asphericity with a refractive central zone that translates to around 2.5 D in near, with optically efficient transition zones, to give a good quality of vision across all distances (Figure 2). Fig. 2. Retinal image simulations. The Mini WELL offers a continuum of foci across all distances (source: SIFI, data on file). What are the advantages of the aspheric approach over other approaches to multifocality? There’s a big problem with a lot of multifocal or extended depth of focus (EDOF) lenses, and that’s the loss of light energy that’s inherent with diffractively separating the incoming light to near, intermediate and distance. The Mini WELL’s progressive optics use more or less all of the light that comes in, and it all gets diverted to the retina and used for vision. This also has the advantage of minimizing any issues with contrast loss, halo or glare – these photic phenomena are almost absent with the Mini WELL which, in several of our studies, has proven itself to be similar in optical performance to monofocal IOLs when it comes to these factors. This is a truly EDOF lens – because the patient experiences continuous focus, unlike seeing things sharply at, say, 30 cm for near, then nothing, then back towards sharpness around 80 cm, then very little until you reach 5 meters or so for distance. For the patient, it feels like he or she is accommodating – the eye can zoom automatically between two different distances, unconsciously. In other words, from near to distance, they experience a continuous flow of good-quality images. What’s it like for the surgeon to implant? It’s an IOL with four haptics, and this means that you get a very nice and safe fixation in the capsular bag. As it’s a true four-point fixation (unlike a plate haptic), it results in very good lens centration, which is important for an IOL like this – even when the capsulorhexis is decentered. The lens is very thin, and comes pre-packaged, hydrated, in an injector with a special coating that means, in my experience, you don’t need any viscoelastic to inject the lens – you just inject with saline solution. I usually implant it under irrigation, so I have the irrigation handpiece through the paracentesis and I just inject the lens (without viscoelastic) into the capsular bag. The lens is so soft and forgiving, that I’d say it’s straightforward and easy to use – even with irrigation. What would a typical candidate for Mini WELL look like? Pretty much like any multifocal IOL candidate. For example, if you have a patient who comes to you and says “I definitely want sharp near vision at around 35 cm, I want to see my desktop at 70 cm, and I want good distance vision” then you might consider recommending a multifocal, diffractive IOL. You can tell the patient that if everything goes well, they should achieve their target vision. But here’s the thing with diffractive optics: the patient is still likely to experience glare, halo and decreased contrast – typically, they’ll be using only around 30 percent of the incoming light for near vision. This leads to the discussion about side effects. If the same patient says, “I want all of this, but without the side effects,” then you should consider the Mini WELL. Again, just like with any other multifocal IOL, you can’t give them a 100 percent guarantee of no side effects, or that their near acuity will be absolutely perfect. You should underpromise and overdeliver. And remember, with the Mini WELL, the patient will be getting nearly 100 percent of the light coming in at near – not 30 percent – and the photic phenomena are almost entirely absent. Through our questionnaire studies, we’re finding that over 90 percent of patients report that they simply don’t need spectacles for their usual and daily activities after implantation – and this includes car driving during the day and night. We’re just not seeing any issues: these are highly satisfied patients. Can the extremes of pupil size be an issue? We haven’t really had any problems. Admittedly, we wouldn’t implant this lens in patients with glaucoma who have miotic pupils from pilocarpine use (and frankly, we wouldn’t place any multifocal IOL in these patients – they experience a depth of focus effect thanks to their small pupils). But implanting it in slightly larger pupils, like you get in younger patients, is not problematic, and we haven’t really had an issue with pupil size with our typical cataract surgery cases either. What are your thoughts on the MINI WELL IOL overall? For the surgeon, it’s soft and forgiving to handle and easy to implant. For the patient, they get an IOL that gives good quality images across all distances that, to the patient, almost feels like the lens is accommodating, even though it is not an accommodative IOL! Gerd Auffarth is the Director of the David J. Apple International Laboratory of Ocular Pathology and IVCRC as well as Chairman of the Department of Ophthalmology, Ruprecht-Karls-University of Heidelberg, Germany. Our mission always has been and continues to be, the development and marketing of effective and innovative ophthalmic therapies. SIFI was founded in 1935 by two pharmacists who formulated ophthalmic ointments to meet local demand, and this ophthalmic focus continues to this day – we’ve invested in state-of-the-art facilities devoted to ophthalmology, like those we built in 2009 to develop and manufacture advanced IOLs. Our vision now encompasses the evolution of SIFI into an international eye care player, leveraging on our domestic leadership and high-quality product portfolio. Eyecare is experiencing a shift in how research and development is approached: it’s changing from an environment of largely incremental innovations and improvements, to a more disruptive one fueled by higher investments, particularly in the US biotech sector. Ophthalmic companies are now part of the mainstream mergers and acquisitions market, with multibillion dollars deals being completed each year. We believe the major challenges in the future will be obtaining market access with government reimbursement for those innovative, yet costly technologies. This is a time of shrinking healthcare budgets – especially in Europe – and has necessarily involved restrictions on pricing and volumes. However, new digital technologies may also represent a big opportunity to create significant value for patients and payers to reduce inefficiencies in the provision of eye care across the globe: we will see how fast ophthalmic companies will embrace these opportunities. SIFI works closely with surgeons to satisfy unmet medical needs through innovative technologies and high-level of service that helps surgeons improve patients’ safety and quality of life. As a next step in the development of our IOL technology platform, we will be launching Mini WELL Toric in the second half of this year, thus combining the most advanced IOL presbyopia correcting technology with a novel method of correcting astigmatism.